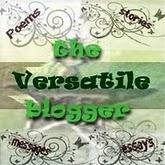 This past week I received not one, but two Versatile Blogger Awards. My first blogging awards ever. It is quite exciting and an honor to be recognized by my fellow bloggers and friends, Going Jane and Beyer Beware. Thank you Jane and Leah!! Pass the award on to 15 bloggers who you have recently discovered and think are fantastic. I have the same middle name as both of my sisters; even though, one of them is spelled differently. I was on the livestock judging team and horse judging team in college even though I really don't know much about horses. I was a 10 year 4-H member and am almost reminded daily of the impact it had on my life and continues to have. I love cooking and baking but I don't have much time to do either. And now on to my fellow bloggers that I would like to recognize. Going Jane and Beyer Beware already recognized several of the blogs I follow with this award so I don't want to repeat, but I want to recognize them as these are some great women. So be sure to check them out. 1. DesignHER Momma. I first started following her on twitter before the birth of her third child and now follow her blog too as she shares real life issues and throws in some fun and laughs along the way. 2. a Latte' with Ott, A She is an awesome baker and has a great green thumb as well. She also has a sense of adventure which this mom of 3 loves to read about. 3. A Couple of Sweet Things These women make amazing cakes, cookies, and other baked items and I happen to be related to one by marriage which is a definite added bonus. 4. As the Forest(e) Grows I love reading about how much fun Mrs. Foreste is having being a first time mom of her almost one year old. As a mother of 3, it is refreshing to relive the memories of life with my first born. So I didn't quite give you 15 blogs, but I hope you enjoy all of these blogs as much as me and thanks again to Going Jane and Beyer Beware. Thanks for the award. I am honored and enjoy reading your blog and your sewing adventures as well. Happy blogging! Love the new header - very professional! Yeah, I think this is one of those things where you have to be really ready for a change in order for it to happen. I'm sure there are other areas of my life I could have focused on, but I'm not ready or committed to changing those problems, yet. You know? So I think it's fine to ignore it for now! Having a clean house is pretty low on my list of priorities, but being sane is pretty high! And I really feel like a clean, organized house will lead to a clean, organized, less stressful life! Now I'm getting too deep for you again!